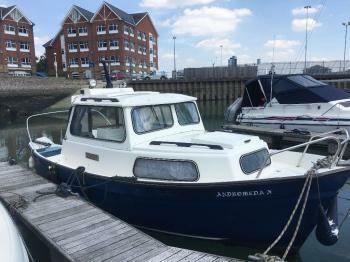 The Hardy Motor Boat Owners Club Message Board | Miscellaneous topics | Which model of Hardy boat is this? Message board > Miscellaneous topics > Which model of Hardy boat is this? Your boat would have been built between 1987 and 1992. If the little metal plate which Rob has mentioned has been removed by someone, then have a look on the top surface of the hull where it curves around at the stern and you should see the boat number etched into the grp. Get back to me with the number if you can find it and I will try and find a build date for you. Thanks for the helpful update and confirmation of the model. Do you know roughly when these were built and was the hull design the same as the standard Pilot. It is indeed a river pilot and one that was build during my time at Hardy Marine. If it has folding doors and no bulkhead, it is likely to be a River Pilot. If you get the number off the metal builders plate (which is normally below the steering wheel) and phone Hardy Marine, they will probably give you the year of manufacture and also confirm it is a River Pilot. Having explored web sites. I am hoping this is the Hardy River Pilot - mid '80s. I have recently purchased what wwas described as a Hardy 20ft Pilot. Although I have seen it I have not yet taken possession. It is securely locked in a marina and collection will be in two weeks. I cannot identify the model as a Pilot. There is no porthole and the deck in front of the wheelhouse seems to be shorter tham most. The wheelhouse has folding doors and there are two bunks. I am wondering whether it is actually a Navigator and wonder whether anybody can assist?